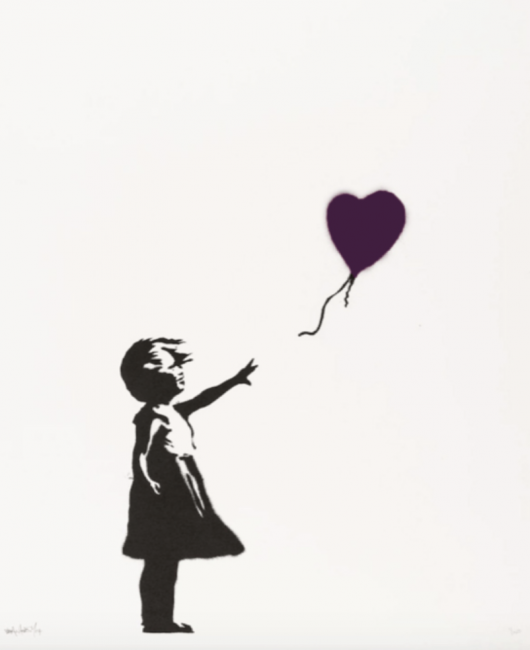 Girl with Balloon (Purple) by Banksy from the Prints. Arguably the most controversial street artist in the world, Banksy has developed an entire art subculture devoted to his works. Banksy’s art can impact any location at any given moment. Hisidentity remains unknown, even after over 20 years of being involved with the graffiti scene. He has worked with many different types of street art media and street art types. His work not only includes many powerful, often controversial images, but they may also be found throughout the Internet as viral images. His artwork has appeared throughout London and other locations around the world. Bansky’s artwork is characterized by striking images, often combined with slogans. His work regularly engages political themes, satirically critiquing war, capitalism, hypocrisy and greed.